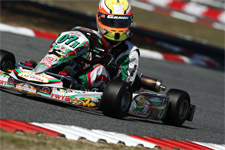 GT7 Motorsports team driver Dylan Tavella had his eyes set on the US Micro Max Championship this past week. 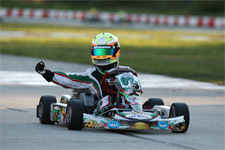 Taking on the 2012 Rotax Max Challenge United States Grand Nationals at the Jet Karting of Michiana Raceway facility near South Bend, Indiana, Tavella posted some impressive results, including pole position in the stacked Micro Max field. 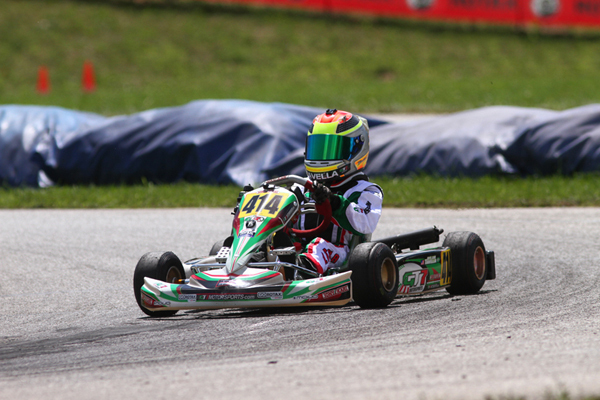 Battling changing weather conditions at the northern Indiana track left Tavella without the national title, but the karting hot shoe still posted some impressive results at the premier US Rotax event. 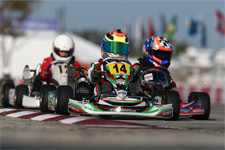 Earning a win at the gear up event for the US Rotax Grands earlier this summer, Tavella entered as one of the favorites in the Micro Max division. 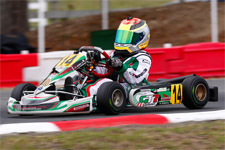 Taking on a field of 22 competitors, Tavella would put his GT7 Motorsports prepared Tony Kart near the top of the time sheets in every one of the unofficial practice sessions. Looking like the driver to beat, the ten-year-old solidified that notion by scoring the pole position during Thursday's wet qualifying session. Back on track later that day for the first of three heats, Tavella would endure another wet session as rain continued to fall at the northern Indiana facility. Navigating the wet racetrack in the lead for the opening flyers, Tavella would be involved in an incident going through the chicane, falling outside the top-ten. Using the remaining laps to make up a few positions, Tavella would cross the stripe for the first heat in the sixth place. Back on track Friday for the final two heats, Tavella would lead the field to green for a dry heat two. Holding point until lap three, Tavella would then engage in a battle for the lead, slicing and dicing with four fellow drivers. At the line, Tavella would end his second heat race with a fifth place finish. The third and final heat would again see Tavella lead the opening laps, gapping the field by one second by lap three. 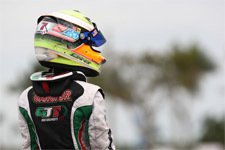 The second place driver soon reeled Tavella in however, as the GT7 Motorsports driver was relegated to P2 after being passed with three to go. Tavella's solid heat race efforts placed him third in the combined heat points, setting up an inside row two starting position for Saturday's prefinal event. Rain returned in the morning for Championship Saturday, with Tavella ready to lay it on the line for the Micro Max title. 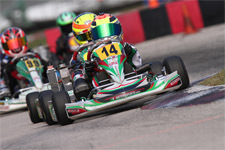 Slotting into fourth at the start of the 14-lap prefinal, Tavella was again relegated down the running order after contact in turn seven on the second lap. Back in ninth, Tavella used his speed to recover to a sixth place finish. With the rain and mist now moving out of the area, the Micro Max drivers would head out for the final race under sunny and mild conditions. A great start saw Tavella up to the third place by the third lap of the final. Passed on the next flyer, Tavella and the third place driver would work together to try and catch the leaders. Despite running the fastest lap of the race, Tavella would run the remaining laps in the fourth place, just missing the podium at the race conclusion. Tavella would like to thank his tuner and coach Bob Radivoy, as well as the entire GT7 Motorsports crew. Up next for Tavella is a return to the Rotax Northeast Region, where Tavella has scored six wins in six starts so far in 2012.